The Free Library location at 1901 Vine Street. President Trump has proposed eliminating federal funding for libraries for the third year in a row. Rich parents allegedly paid $25 million to a “counselor” to catapult their spawn into elite colleges at the expense of smarter, harder-working plebes. Fourteen defendants in that case have agreed to plead guilty, and this won’t be the only time the wealthy shortchanged the rest of us. For the third year in a row, our billionaire-run White House wants to kill the Institute of Museum and Library Services, the main federal funder of libraries — major enablers of social and economic mobility. Trump's outlandish new budget proposal will almost surely flop on Capitol Hill. Still, this mean-spiritedness shows why libraries shouldn’t rely on public money alone. K-12 libraries, in particular, were imperiled even before Trump’s election. Thousands of certified K-12 librarians have lost their jobs in recent years despite the well-documented academic benefits of having them around. The School District of Philadelphia has been especially hard hit, with just eight certified full-time K-12 librarians remaining as of January 2017. But there may be an at least partial solution: a national library endowment to help K-12 and public libraries in Philadelphia and elsewhere. An endowment would offer dedicated, protected funding for libraries and their services, perhaps financed by public-spirited billionaires to avoid competition with local Friends of the Library-style groups. More funding would have major service impacts, like an increased supply of well-prepared, diverse librarians and, through online collections, more e-books. Waits for digital best-sellers wouldn’t be as long. Beyond that, consider the possibilities of better-funded K-12 and public libraries as dream-creators for teenagers and jobless adults. We’re talking about more than books alone — everything from family literacy classes and 3D printers to appearances by sports stars and other celebrities to help nudge young people in the right direction. Libraries raise aspirations, economic and otherwise. In Roanoke, Va., librarians helped inspire Salena Sullivan — a young black woman and the daughter of a low-income single mother — to make it to Harvard and eventually become a librarian herself. Just one of many library successes. Brian Koberlein, once a Midwestern farm boy, says sci-fi books and librarians were responsible for his becoming an astrophysicist. U.S. Rep. Elijah Cummings of Maryland, son of ex-sharecroppers, recalls how librarians helped him break out of special education classes. 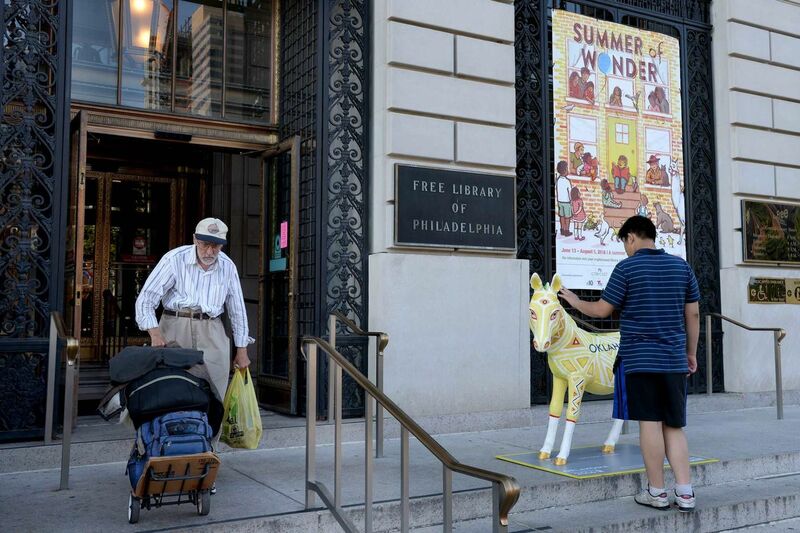 In Philadelphia, libraries are doing their best. But Mayor Jim Kenney’s new library budget would not fully pay for sufficient staffing and meet state standards for expenditures on books and other collection items. At least 12 percent of a library’s operating budget needs to go toward such materials. While a national endowment would hardly end all local or national library woes, it could especially help poor communities, the ones most starved of tax money and local library donors. As of now, all public library endowments and equivalents in the United States add up to under $5 billion or so. By contrast, Harvard’s endowment alone is worth more than $35 billion. About a decade ago, Harvard Law School helped hatch an independent group called the Digital Public Library of America, and in fact, the DPLA has excelled in such areas as digital preservation of historical documents, including those at the local and state levels. The DPLA also has curated collections of e-books for low-income schools. But this kind of project doesn’t sufficiently focus on basic literacy challenges like Philadelphia’s. More than a fifth of the adults in Philadelphia lacked even basic literary skills as of 2009, according to the National Center for Education Statistics. And today’s young people will need more than just rudimentary skills to succeed in a high-tech society. Another important investment for young people’s futures would be recruiting more librarians from low-income, working-class, and minority backgrounds — and the recruitment of more men to enter the field. A 2009-2010 survey found that of 114,227 credentialed librarians back then, only 563 were black males and a mere 522 were Latino men. The numbers surely are still dismal for anyone caring about role models for young African American and Latino boys and girls. Scholarships and recruitment drives could go a long way. An endowment could address other needs, both brick-and-mortar and digital. The DPLA could evolve into a stellar digital academic library system while sharing people and content with a national digital public library system. But two systems, please. Otherwise, prestigious academics may set the tone at the expense of minorities and poor people. Of the more than 400 words on a Web page promoting a DPLA event in Chicago April 17-18, we see not one direct reference to “literacy” or “reading.” All the e-books in the cosmos won’t suffice if K-12 and public libraries lack the money to sell reading and knowledge to those most in need. David H. Rothman, a former poverty beat reporter, is reachable at drothman@libraryendowment.org. He is a co-founder of LibraryEndowment.org, a collaboration with several veteran librarians.